Emission control systems, in automobiles, is employed to limit the discharge of noxious gases from the internal-combustion engine and other components. There are three main sources of these gases: the engine exhaust, the crankcase, and the fuel tank and carburetor. Carbon Monoxide, hydrocarbons, and oxides of nitrogen are created during the combustion process and are emitted in the atmosphere. Hydrocarbons emitted are also the result of vaporization of gasoline and from the crank case of the automobile. In the late 1960’s the first emission controls were introduced, basically they were “add –on components that solved a particular emission need. In 1968 positive crankcase ventilation (PCV) became standard and eliminated blowby emissions as a major source of automotive pollution. In 1971 evaporative emissions control systems (Charcoal Canisters, Sealed fuel systems) were added that contributed to eliminating fuel vapours. Exhaust gas recirculation (EGR) was added in 1973, which lowered harmful oxides of nitrogen (NOX) emissions. The most significant and important add on came in 1975 where the auto makers were required to install catalytic converters on all new cars. Let us understand different type of emission control system. The early two-way converters (so-called because they eliminated the two pollutants HC and CO) acted like an afterburner to reburn the pollutants in the exhaust. An air pump or an aspirator system provided the extra oxygen in the exhaust to get the job done. Two-way converters were used up until 1981 when three-way” converters were introduced. Three-way converters also reduced NOX concentrations in the exhaust, but required the addition of a computerized feedback fuel control system to do so. Unlike the earlier two-way converters that could perform their job relatively efficiently with a lean fuel mixture, the catalyst inside a three-way converter that reduces NOX requires a rich fuel mixture. But a rich fuel mixture increases CO levels in the exhaust. So to reduce all three pollutants (HC, CO and NOX), a three-way converter requires a fuel mixture that constantly changes or flip flops back and forth from rich to lean. This, in turn, requires feedback carburetion or electronic fuel injection, plus an oxygen sensor in the exhaust to keep tabs on what is happening with the fuel mixture. Like the earlier two-way converters, three-way converters also require extra oxygen from an air pump or aspirator system, and some “three-way plus oxygen” converters are designed so air is routed right to the converter itself for more efficient operation. The positive crankcase ventilation system keeps blowby gases from escaping from the engine. During combustion, a portion of the burned air/fuel mixture is forced past the piston rings and ends up in the crankcase and oil pan. These gases are a raw and untreated pollutant. The PCV system is designed to draw these untreated gases from the crankcase and reintroduce them into the intake stream. Once they enter the intake stream, they can be burned off by the combustion process and other emissions control components (such as an air injection system and/or a catalytic converter). Blowby gases that are not evacuated from the crankcase and oil pan can contribute to engine corrosion, oil dilution, and engine deposits or sludge. Since the system must be sealed to operate properly, oil fill caps and dipsticks need to be in place and properly seated or tightened. Some related parts of a positive crankcase ventilation system can include, but are not limited to: PCV valve, vacuum hose(s), sealed oil cap and dipstick, and fresh air intake tube. EGR reduces the formation of oxides of nitrogen by diluting the air/fuel mixture with exhaust. This lowers combustion temperatures to keep it under 2800 degree F so little NOX is formed (the higher the flame temperature, the higher the rate at which oxygen and nitrogen react to form NOX). As an added benefit, EGR also helps prevent detonation. Some vehicles have “positive backpressure” EGR valves while others have “negative backpressure” EGR valves. Both types rely on exhaust system backpressure to open the valve. But the two types are not interchangeable. The vacuum control plumbing to the EGR valve usually includes a temperature vacuum switch (TVS) or solenoid to block or bleed vacuum until the engine warms up. On newer vehicles with computerized engine controls, the computer usually regulates the solenoid to further modify the opening of the EGR valve. Some vehicles even have an EGR valve that is driven by a small electric motor or uses solenoids rather than being vacuum-actuated for more precise control of this emission function. EGR valves do not normally require maintenance, but can become clogged with carbon deposits that cause the valve to stick or prevent it from opening or closing properly. An EGR valve that is stuck open will act like a vacuum leak and cause a rough idle and stalling. An EGR valve that has failed, refuses to open will allow elevated NOX emissions and may also cause a detonation (spark knock) problem. Dirty EGR valves can sometimes be cleaned, but if the valve itself is defective it must be replaced. Fuel vaporizes slowly when it is cold, so heating the air before it enters the carburetor or throttle body improved fuel vaporization and allows the engine to more easily maintain a balanced air/fuel mixture. Most such engines have a heated air intake system that draws warm air from a stove around the exhaust manifold into the air cleaner. One part that is often needed here is the flexible tubing that connects the air cleaner to the exhaust stove. If damaged or missing, the engine may hesitate and stumble when cold. Another early fuel evaporation aid on older V6 and V8 engines is a heat riser valve. The valve is located on one exhaust manifold. When the engine is cold, the valve closes to blocks the flow of exhaust so it will be forced back through a crossover passage in the intake manifold directly under the carburetor. The hot exhaust heats the manifold to speed fuel vaporization and engine warm-up. Once the engine warms up, the heat riser valve opens. The heat riser valve needs to be replaced if it is sticking or inoperative. On some older engines, an electrically-heated EFE (Early fuel evaporator) grid is used under the carburetor or throttle body to aid fuel vaporization when the engine is cold. A timer turns the grid off after a fixed period of time. If the grid fails to heat (electrical connection, etc. ), the engine may hesitate and trip when cold. Electric heater grids in the intake system are also used on some late model diesel engines for easier starting and cold performance. OBD II is designed to detect emission problems. 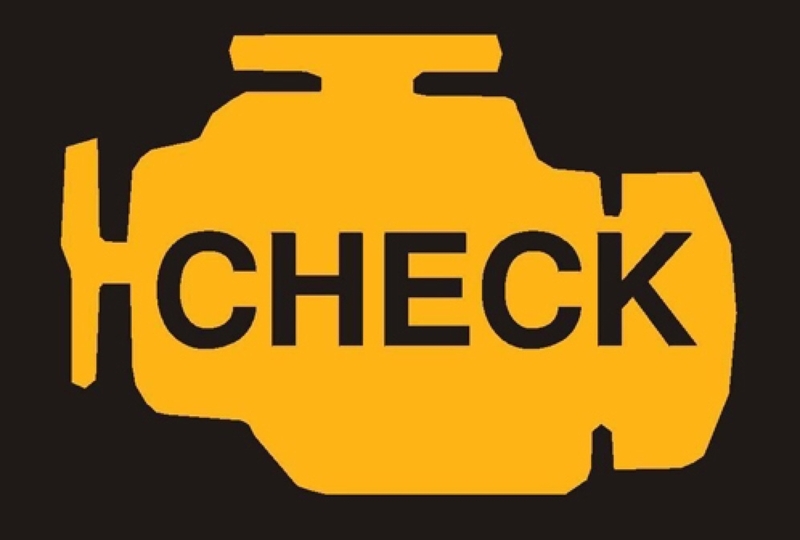 When a problem is detected, the Check Engine light comes on and a diagnostic trouble code is stored in the powertrain computer (PCM). Later, the code can be read using a scan tool to determine the nature of the problem.